Pencils Books and Dirty Looks: Whoa, where did the school year go?? And a quick giveaway!! Whoa, where did the school year go?? And a quick giveaway!! They say time flies when you're having fun. If that's the case, this school year was a blast! I can't believe we only have eight days of school left. The end of the school year can be an exciting time for students and teachers. I try to keep on a schedule up until the last possible moment with as little down time as possible! 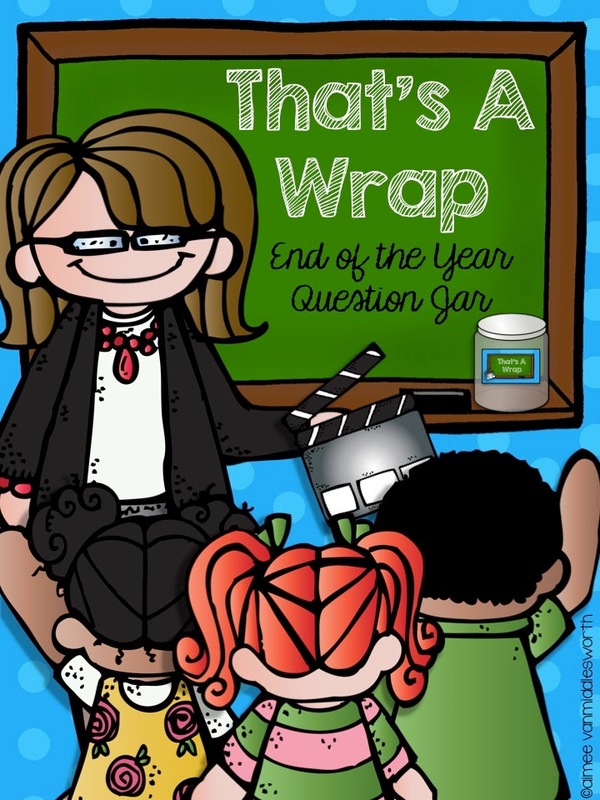 One of the ways I've kept students engaged the last couple of days is by using my That's A Wrap End of the School Year Question Jar. Any time we have a few minutes here or there, I have a student pull a question out of the jar. 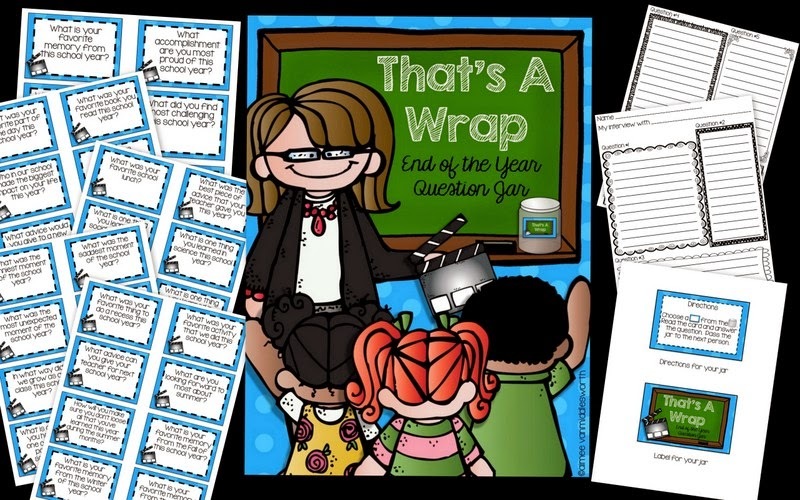 All of the questions allow students to reflect on the school year. Sometimes we answer the questions in whole group, other times I have them buddy share their answers. This past Friday we used the question as our Friday writing prompt. I'm hoping the questions will also help refresh their memory as we start our end of the year memory books next week! You can check the That's A Wrap Jar out in my TpT store. I would love to give it away to one lucky winner! Simply comment with your favorite end of the year activity and I'll choose a winner tomorrow night. Can't wait to hear all your ideas! I like to do something unexpected...like one time I took the kids to the vending machine at the end of the block and bought everyone a drink of their choice. Which is a big deal, as we all 'healthy snack' usually. And I told the kids that no one else better find out or I would be in trouble. (Not 100% true...I cleared it with our principal since we had to cross the street) but you should have seen them coming back inside with the cans hidden! We take a field trip to Lake Michigan to explore, do science activities, fly kites, and build in the sand. But we do not go swimming. Many of my kids have never visited one of the Great Lakes and it's only one and a half hours away! I can appreciate you saying that your students have never visited the Lakes even though they live so close. We are right on one of the Lakes and many of mine have never been to it. They have driven past it, but have never gone to shoreline. As far me, on hot summer days I am there!!!! Our favorite end of the year activity is not really an academic one. It's a tradition (probably for twenty years or more) that on the last day of school my sixth graders challenge the fifth graders to a kickball game. There's even a trophy involved. It's almost like a rite of passage for the fifth graders. 14 more alarm clocks and counting! Our favorite end of the year activity is our end of the year party! Our favorite activity is either making stomp rockets or homemade ice cream! My favorite end of year activity is having the students write letters to the incoming third graders. I like to see what advice they have to offer! I love that we do field day where we have the parents run games for us and have a special lunch. We'll also be doing other fun theme days, but field day is my favorite. My favorite end of the year activity is one I am doing for the first time this year! It's a countdown for the last ten days and each day we have a different activity like sitting next to a friend or eating lunch in the classroom. My kiddos saw the sign I had just laminated and have been asking me about it ever since!